OCEANIA RESORT - Emerald View Two-Bedroom condo with Pool and Spectacular Ocean View, sleeps 6. The Emerald Two-bedroom condo is ideally furnished to maximize sleeping capacity, and has a master bedroom with a king-size bed, a walk-in closet, and a full bathroom; a second bedroom with two double (full-size) beds, built-in closets and a second full bathroom; a living room with a queen-size sofa-bed; a full-sized fully equipped kitchen with 4-seat dining bar-table, and a laundry (washer/dryer) facility corridor. There is a regular balcony stretching across the living room and the master bedroom with a spectacular ocean view. This unit provides you with 1,500 sq.ft. of living space. A code-lock safety box, cable TV, two high-definition flatscreen TV's (in the living room and master bedroom), free broadband wired and wireless internet, are all available for your comfort. This unit is located in the Palm (=lobby) building on the fourth floor. -Sleeps max 6. The facilities include three large swimming pools, a kiddy pool, a gym, a sauna, a business center, two tennis courts and a kids playroom. Wonderful landscaping on the premises. Enjoy the tranquility of the resort and stroll on the beautiful beach just steps in front of the complex. Note: this condo has been updated with a new AC and washer/dryer (October of 2019). Our Concierge Services allow you to plan your vacation so you can enjoy the best Aruba has to offer. Make this your most memorable and hassle-free Aruba vacation and BOOK your activities with us ahead of time! A rental car is recommended and our concierge service coordinator will be more than happy to assist you in reserving one. Prestige Vacations Aruba offers vacation properties for rent in Aruba. Specializing in ocean front, beachfront and 'near the beach' vacation rentals. Indulge In Aruba: We treat all of our guests as special guests. For additional low and reasonable fees, we can arrange anything to make your stay in our condo the most comfortable and enjoyable one you ever experienced during a vacation. We can arrange all your sea and land activities, pick you up at the airport, provide a trustworthy babysitter, arrange a low-rate rental car, do your first-day groceries, or even have a chef cook available for that special or romantic dinner in your condo. Just make your wishes clear to us, and we will do the utmost to comply. We had a wonderful vacation at Oceania Resort! The Condo was great! Aruba is a fantastic place ..... we loved our vacation. Sharon Taylor at Prestige was wonderful. She provided all the details that made our stay at this Condo wonderful. She set up two tours for us .... a full tour of the Island and a walking tour of Downtown Aruba. Sharon Taylor brought over maintenance men to our condo to repair the shower and set up the internet. The Dryer was not working well. The Condo was well stocked with everything we needed. We will stay here again! Thank you for your 5-star review of your wonderful vacation at Oceania Resort with us! We are happy that you enjoyed your our island and that Sharon assisted you with your activities. Great that Kenneth assisted promptly with the maintenance issues that you experience. We look forward to welcoming you again as a guest. It’s all about being steps away from having your toes in the sand, Eagle Beach! Loved having morning coffee on balcony, condo had all the comforts of home. We had stayed at the Oceania multiple times and won’t stay any where else, it safe and more quiet than the busy streets at Palm Beach. This was an excellent condo. Had all the amenities that one could ask for. Oeania is a beautiful property located right on the beautiful Eagle Beach. The low rise area is a great area that is much less crowded than the high rise area. It is right in tbe middle and is a quick taxi or bus ride to the high rise area or the downtown area. Both of which I highly recommend seeing. Prestige was wonderful to work with and helped answer all my questions and arranged our rental car that we rented for a day to see the other areas of the island at our own pace (i highly recommend this) and arranged our snorkeling tour. If you rent a condo in Oceania I highly recommend going through prestige. They made our Aruba vacation to help celebrate my 50th bday and 25th Wedding Anniversary a trip to remember. Congratulations on your 50th Bday and 25th Wedding Anniversary! Thank you very much for your 5star review. We are happy to read you enjoyed your stay with us, especially the condo, the location and our services. We look forward to welcoming you soon back. Great place away from the crowds. Unit and property were well maintained. Thank you for your review! We look forward to weclome you back soon. We had a wonderful week in Aruba staying at this property in March. The unit was clean and well equipped. The view from the balcony was amazing. The grounds were amazing (kids were fascinated with the iguanas and other lizards) and pools were fantastic. The location is great - walking distance to everything including Eagle beach (one the nicest beaches I have ever been to), the grocery store (10 min walk) and several restaurants/bars. We did not rent a car except for one day to explore the island (and go to Baby Beach), which I recommend. It is very reasonable to take a taxi to the hi-rise area for shopping and dinner as well. We felt very safe on the island and even more so in the complex (security was always present). Overall, we had a great vacation in Aruba and would highly recommend this unit. We couldn't have asked for a better vacation! My family and I stayed in two great condos - fabulous views and easy access to the ocean (right across the street). The condos themselves were really well cared for. Rachel at Prestige was so great to work with in setting this all up - very responsive, friendly, and extremely helpful. My family rented two condo's right next to one another and it accommodated us all very well. Everyone was quite complimentary & we've decided to make it an annual vacation. For our family, the location of the condos were perfect because they were away from the more crowded resorts on Palm Beach. We didn't have any kids, so activities were not a concern. There weren't too many nearby restaurants or bars to choose from, but we're also big walkers and didn't mind the 2 mile hike to the hustle and bustle of Palm Beach. If you're looking for a relaxing stay away from the crowds, I definitely recommended this spot. I also admired the security on on the complex, which was pretty tight. It was a bit of a downer not being able to swim in the pools after 8 or 10pm, but the ocean was right across the street, so it was nothing to do an ocean midnight swim instead. The beaches were also amazingly clean and sparse - no seaweed, rocks, or trash. I felt quite safe swimming alone at night and highly recommend it to anyone visiting the island. I could go on for quite a while praising Aruba and Oceania, but I'll stop here and simply highly recommend staying at a Prestige Realty property, as I'm sure they are all as good as the two my family and I stayed in. Thank you for this amazingly wonderful review of the Oceania complex, our condos, and our customary hospitality service to our guests! We at Prestige just do our best to make the guests feel at home, and we highly appreciate it when this is shown in nice reviews like this one. To mainatain the peace and serenity of the resort, the four large swimming pools at this resort may indeed not be used after 10 pm, as this may cause disturbance to guests staying in units nearby the pools, and we wouldn't want to have that, would we? We're also glad that you enjoyed the uncrowdyness of the Eagle Beach right in front of the complex, which actually is the most important (natural!) amenity of this resort. We thank you again, and look forward to being your host once more anytime you decide to return to Aruba! Rachel. 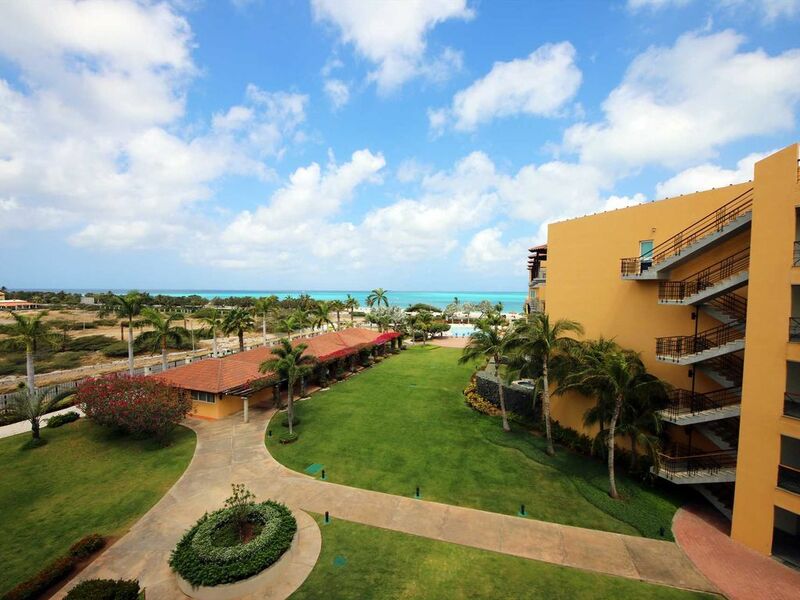 This condo complex is located on the boulevard along the nicest beach of Aruba: the Eagle Beach. The Eagle Beach has been awarded as one of the ten most beautiful beaches in the world! As you leave the town from Oranjestad towards the major hotels and resorts, pass the roundabout, take a left at the first traffic lights. Drive through and you will find the Oceania resort in less than 1 mile on your right hand. Beachfront, good access, close to town and many exquisite restaurants on the island. Being on the nicest beach of Aruba, with regular bus service and taxis at your fingertips, a rental car is definitely not a requirement. However, if you wish to explore the more distant and remote areas of the island (which we think you should...), a rental car is then recommended.